Of course the fact that Anthony's just a denier blogger has never stopped him from taking a swipe at proper scientists. In fact, it's probably why he takes a swipe. After various odd jobs on school boards and announcing weather on tv, he's finally found success at last, of a sort. He'll never make it in the scientific world but by making a career of scoffing at science he's managed to become a minor celebrity among the scientific illiterati. The dregs of society. The Luddites. Claim: What would have happened to the ozone layer if chlorofluorocarbons (CFCs) had not been regulated? A new modeling based paper in Atmospheric Chemistry and Physics takes on that question directly. Well, what would have happened? The regulation of ODSs [ozone depleting substances] was based upon the ozone assessments that presented the consensus of the science community. The regulation presupposed that a lack of action would lead to severe ozone depletion with consequent severe increases of solar UV radiation levels at the Earth’s surface. Because of the successful regulation of ODSs, ozone science has now entered into the accountability phase. There are two relevant questions in this phase. First, are ODS levels decreasing and ozone increasing as expected because of the Montreal Protocol regulations? Second, what would have happened to the atmosphere if no actions had been taken? That is to say, what kind of world was avoided? It is this latter question that is the focus of the present study. It was Mario Molina and F Sherwood Rowland who first alerted the scientific community and the world to the dangers of ozone depletion. You can get a copy of the 1974 paper in Nature by Molina and Rowland 1974 here. I decided to see what Anthony has written about ozone in the past. It's a bit of a mix. At one stage in September 2009 he acted as if he knew something about the subject and accepted the science, but it soon becomes obvious that all he did was copy and paste press releases, as usual. For example, that article in September 2009 was preceded by one of his classic backflips here, where he got pulled up for the title of one of his articles: "Galactic Cosmic Rays May Be Responsible For The Antarctic Ozone Hole". That was back in March 2009, just a few days after the publication of the Newman & co paper. I did a quick scan to find out what happened to that notion, which was put forward by Q.-B. Lu of the University of Waterloo (full paper here). Seems to me that Q.-B. Lu is about the only one who favours Lu's idea, with other researchers showing why it ain't so, including Jens-Uwe Grooß and Rolf Müller. how do we know if there hasn't always been an ozone hole prior to our ability to measure it from the late 1950′s? First of all, back in the 1950s there wasn't an ozone "hole" over Antarctica of the type there is today. It was first reported in the 1980s (eg Farman et al 1985). Secondly, the chemistry is now quite well understood as discussed by Molina and Rowland (1974), Solomon et al (1986), Drew Shindell and co (1998) - who elaborate on the importance of temperature - and others. For a simple explanation, the EPA account is not bad. Wikipedia has a longer description and isn't too technical. Anyway, as you'd expect, Anthony Watts flip flops between proper scientific articles and ones from "CFC deniers" but always with the theme "it's not bad". Deniers need nothing more than to be reassured. I think the crowd at WUWT are quite pleased to protest something other than global warming and the greenhouse effect, although some of them probably aren't too clear on the difference between them. I do have a strong suspicion about the whole CFCs issue. As I recall, the chemical was banned on the grounds that lab tests and models showed that it could damage ozone – there were few actual observations in the field, and those which were done were inconclusive. I also believe that the banning also came at a very convenient time for DuPont, which would otherwise have lost the patent on a very lucrative chemical, and seen other companies undercut it heavily. They took CFCs out of my asthma inhaler and replaced it with something less effective. I won’t forgive them for that. Thing is, the CFC's in asthma inhalers were purely a propellant like they were in all spray cans. They didn't have any medicinal properties. In regard to physical properties, this article suggests their replacement has some advantages. sunshinehours1 is suffering a kind of reverse placebo effect. cfc’s are too heavy and can not rise up, they sink rapidly, thump. The basic laws of physics say that lighter materials will float above heavier materials. So, if the atomic weight of a free Nitrogen molecule (N2) is 14 amu’s and that of a free Oxygen molecule (O2) is 16 amu’s and that of a free CFC-12 molecule is 64 amu’s, 4.57 time heavier than a Nitrogen molecule and 4 time heavier than an Oxygen molecule, the question to ask is how did something so heavy, comparatively, get up to the ozone layer, between 50,000 and 115,000 feet above us? I still don’t understand the mechanism for fairly heavy CFC molecules to get from the Northern hemisphere to the South. What propelled them? The ozone hole was discovered during IGY (International Geophysical Year) back in 1957 – before there was substantial amounts of freon. I was told this back in 1974 – by someone who participated in IGY. The whole scam is the same old thing. Sheep going blind due to uV – a pink eye epidemic. CFCs escaping from airconditioners and refrigerators in the nothern hemisphere sneaking down to the antarctic where these rather heavy molecules were magically lifted up against gravity to go up into the stratosphere where they were disassociated into chlorine atoms while ocean spray chlorine ions were washed out of the atmosphere by rain just like the chlorine atoms injected into the stratosphere by an active volcano down there. CFCs are amazing molecules. They are emitted in an ozone rich environment, and despite being highly reactive, they eschew the “dirty” ozone from our tail pipes, defy gravity, and then fly up above the troposphere to munch on the much tastier ozone deposited by lightning in our upper atmosphere. This molecule exhibits preference and mobility. Could it be a new life form? george e. conant says: March 8, 2014 at 10:25 am cfc’s are too heavy and can not rise up, they sink rapidly, thump. Always wondered why CFCs got that high to destroy ozone, but couldn’t seem to accomplish the same thing at ground level. Lu, Q-B. "Correlation between cosmic rays and ozone depletion." Physical review letters 102, no. 11 (2009): 118501. Molina, Mario J., and F. Sherwood Rowland. 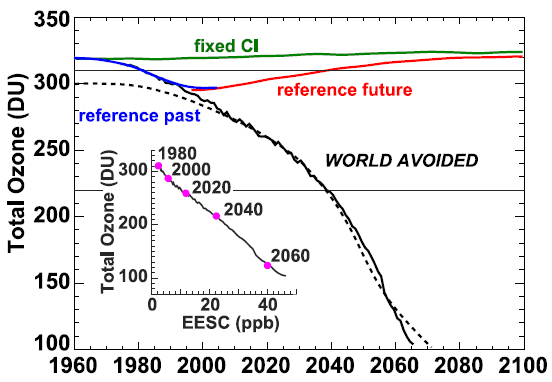 "Stratospheric sink for chloroﬂuoromethanes: chlorine atom-catalysed destruction of ozone." Nature 249, no. 5460 (1974): 810-12. Newman, Paul A., L. D. Oman, A. R. Douglass, E. L. Fleming, S. M. Frith, M. M. Hurwitz, S. R. Kawa et al. "What would have happened to the ozone layer if chlorofluorocarbons (CFCs) had not been regulated?." Atmospheric Chemistry and Physics 9, no. 6 (2009): 2113-2128. Shindell, Drew T., David Rind, and Patrick Lonergan. "Increased polar stratospheric ozone losses and delayed eventual recovery owing to increasing greenhouse-gas concentrations." Nature 392, no. 6676 (1998): 589-592. Solomon, Susan, Rolando R. Garcia, F. Sherwood Rowland, and Donald J. Wuebbles. "On the depletion of Antarctic ozone." Nature 321, no. 6072 (1986): 755-758. Solomon, Susan. "Progress towards a quantitative understanding of Antarctic ozone depletion." Nature 347 (1990): 347-354. They took CFCs out of my asthma inhaler and replaced it with something less effective. I won’t forgive them for that." Actually modern inhalers (and I am a user) are far more effective than those back in the 70s. So the odds are - oh the irony - that sunshinehours1 lives downwind of an industrial site owned by the pollutocrats whose interests sunshinehours1 serves. Millicent, the removal is much more recent than the 1970s; we're talking banned from 2009 by the FDA, with actually sales banned since I think last December. One of the typical problems is that the change to HFAs changed some properties of the inhalers, and users notice that difference. Some then automatically translate that into "not working". For example, the pressure is reduced in the HFA inhalers compared to the CFC inhalers. Users thus do not feel that "normal" push, and think the inhaler does not work or is less effective. Regardless of whether this is true, the placebo effect should not be ignored: patients who think they get non-effective treatment respond on average less than patients who think they get effective treatment. It's a mental thing that is hard to change. That seems ironic because at my last asthma review I was taught a change in technique: they wanted me to breath in more gently so that the stuff was breathed down into the lungs rather than being thrown against the back of the throat (I presume by centrifugal force). Wouldn't lower pressure be better if this is an issue? It's very much related to the placebo effect, in the sense that people who think they get treated for a disease, regardless of whether they really are, often respond better than people who *are* treated but do not know they are being treated. Pittzer: "CFCs are amazing molecules. They are emitted in an ozone rich environment, and despite being highly reactive, ..."
CFCs are not reactive, that is one of the reasons why they make it up to ozone layer. There they are destroyed by hard UV and the chlorine or bromine is released. We life in strange times. In the past such uninformed nonsense would be mainly limited to drunk man in bars, now everyone has to suffer. It is still interesting that the libertarians put up much less resistance against the ozone hole. Ozone is also an example where we need government intervention and international collaboration, where everyone has to participate to stop the emissions of ozone destroying CFCs. Thus it is just like the greenhouse effect a direct ideological problem for libertarians. Still we got it done, with much less protest from the right wing politicians. Yes, the fossil fuel industry is more powerful as the CFC industry, but ideologically there is no real difference. There was a lot of resistance - for example WSJ editorials predicting massively deleterious economic impact from a CFC ban. The parallels with the arguments from "skeptics" related to climate change are quite striking. It is interesting, however, that the persistence of the "skepticism" about CFCs did not have the larger appeal and staying power that "skepticism" about climate change does. "es, the fossil fuel industry is more powerful as the CFC industry, but ideologically there is no real difference." I think there must be more to it than just the relative influence of the fossil fuel and CFC industries, respectively. Not sure what it is, though. There may well be more, but the influence of the industry should not be underestimated. The industry that made CFCs was not dependent on those CFCs (it was not their sole product) and also had alternatives available. Also, the company that invented(!) and produced most CFCs (DuPont, 25% of the global market in the 1980s) actively promised to remove CFCs and supported action against CFCs. This is not a minor message to send out to competitors and above all, consumers. The inventor tells you his product has such major unwanted side effects that it is willing to stop making it. Compare that to fossil fuel companies, who in general rely for at least 90% on those fossil fuels. Also, there are many such companies, and even one mentioning major issues with its products is likely to have a limited effect. In the US ExxonMobil's opinion is heard, while in the UK and the Netherlands Shell's opinion will make significant waves, but still this is only 'locally', as even ExxonMobil only has about 1% of the world market. Of course it helps in the case of CFCs that the US took tough action. As the biggest economy its decisions matter. The ozone threat was more immediate, it was associated with cancer, and the rich and powerful like to play golf and sail their yachts under blue skies. AGW, in contrast, is longer-term and the rich can avoid the consequences, at least in their own minds. Folling Marco, fossil fuels are fundamental to modern economies and modern warfare. All strategic concerns start from there : secure oil supplies for yourself, deny them to your rivals. There's a lot of intellectual inertia in that, and a huge desire for the problem to not exist. In the same vein, the response to Peak Oil was first to deny and then to invade Iraq. The US military are to be commended for the way they're facing up to the problem. In fact a period of military rule might be just what the US needs, considering what they've currently got (if you can bear to). I also think there is more to it, and have written up my thoughts in my new post: Do climate dissenters like climate change? What do you think? The proposed answer is unfortunately not very polite. Dennis Hand "...question to ask is how did something so heavy, comparatively, get up to the ozone layer, between 50,000 and 115,000 feet above us?" I wonder how the ozone got "up there" in the first place, as it is also heavier than air. I expect that Dennis Hand hasn't worked out that if all the atmospheric gases stratified by weight, those of us at sea-level would be suffering from CO2 poisoning (along with all the other heavier-than-air gases). Anybody else notice that Mr Hand can't even work out the molecular weights of N2 and O2? it's obvious, isn't it? the ozone just realised it's too heavy to be up there, which is why it's disappearing from the upper atmosphere, and instead accumulating at ground level. I once had exactly the same issue about imminent global suffocation with Tim Curtin (FSM rest his Gs&T) but I can't find the link to that particular exchange. It's astonishing how this misapprehension often crops up - it seems that intelligence in humans is an optional extra rather than a standard fitting. This is a fairly common form of stupidity, where people don't follow an idea any further than they think they need to. Lindzen did it when he inadvertently proved that glacial/inter-glacial transitions can't happen while proving that climate sensitivity was miniscule. Motivated reasoning doth make fools of us all. You start from A, arrive over target B, relax, pour a stiff one, and proceed directly to the crash-site where somebody will be waiting to steal your wallet and watch..